All this week, our writers have asked when it was that Tom Cruise became a star: Was it in his first screen role for Franco Zeffirelli’s Endless Love, the one he got after being hungover at the audition, which may have checked the frightening intensity that kept him from booking commercial jobs? Or the Bob Seger sequence in Risky Business, the one that turned into a music video utilizing his outtakes? (He didn’t like that very much.) Or maybe the moment producers Don Simpson and Jerry Bruckheimer showed Top Gun to exhibitors, even before shooting the two additional scenes with Cruise and Kelly McGillis that required her to wear a baseball cap because her hair was by then too long and a different color? I think Tom Cruise became a star the day the Legend set burned down. Legend — not featured in our Cruise bracket — was a Ridley Scott fantasy, his first after Blade Runner and the Macintosh commercial “1984”; Cruise played Jack O’ the Green, a character of “pure innocence,” he marveled then, “like nothing I’ve done before.” Cruise was post–Risky Business and coming off the full-frontal grit of All the Right Moves — a piquant contrast, surely, working for a formidable director. Only the movie was … not great, and in production for nearly two years: “Sometimes, I would sit in my dressing room for a week and a half — be called in every morning and not leave till late — and just sit there,” he’d recall. And indeed on the day his agent Paula Wagner came to visit him — June 27, 1984 — the set at Pinewood Studios burned down, a blow from which the perception of the production may never have recovered. At 89 minutes running time, Legend was released in April of 1986 with the hush-hush of a paroled felon. That kept the tracks clear, the following month, for the release of Top Gun. 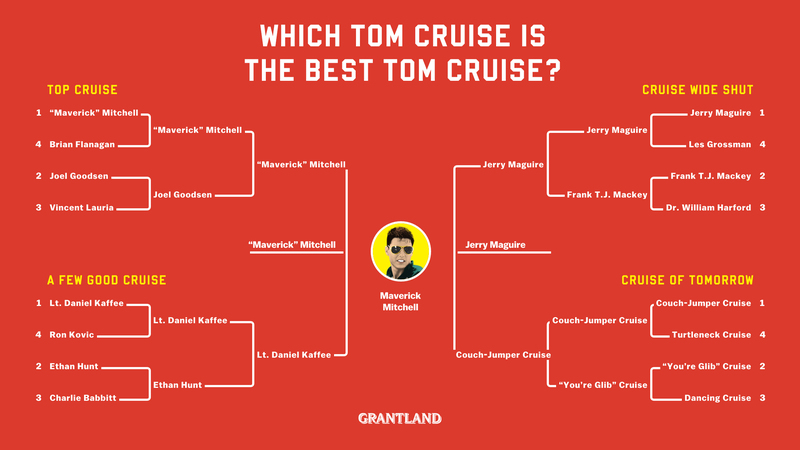 And so 29 years later, Pete “Maverick” Mitchell it is — defeating the sublime Jerry Maguire to rule supreme in the Tom Cruise Bracketeria. Unearthed from their files in the sub-basement, stories of what shaped that role have decades of dust on them: Cruise getting his first nausea-inducing flight in a fighter jet, prepping by watching pilots’ hand motions at the controls, and arriving at the late Don Simpson’s place with a yellow legal pad, just a wet-behind-the-ears 23-year-old star with the chutzpah to tell the former president of production at Paramount, fresh from Beverly Hills Cop, exactly what he thought should happen in that scene in the locker room with Goose. “It didn’t start out as a commercial movie,” Cruise would say, but it sure ended up as one, bestowing upon him the bankability and appeal he’d sustain for decades to come … thanks to Maverick, the chesty, redeemable flyboy, his life shadowed by the death of a father he barely knew. Tom Cruise: I was really disappointed that Parcells retired. I kind of get snippets but I know Parcells has gone. Cruise: I kept hearing bang, bang, bang — what happened? What happened to him? Cruise: Why did he leave? Did he know he was going to leave? Was that it? Me: When New England fired Pete Carroll, that meant unless Parcells retired or resigned or moved upstairs, they would be able to hire Belichick … and because the idea was always for Belichick to take over, Parcells stepped upstairs. Cruise: Is he the general manager then? Me: No, he has a less-defined role than that … So the assumption was that Belichick would therefore ascend, but … he said I’m not taking this job. Cruise: Why? You know, Belichick is an old friend of Parcells. Cruise: So what’s he going to do now? Me: He’s got the job in New England. At least some things have remained the same 15 years later. Many others have not. “I think the best part of my education,” he said then, “was that you have to learn to adapt and change.” Over the following decade and a half, there would be plenty of that: divorce from Nicole Kidman, love and marriage with Katie Holmes, a third child, Suri … then another divorce, announced, to his apparent surprise, days before his 50th birthday. Derision would come, of the sort he’d not previously experienced in the public sphere: Oprah and the couch, Going Clear and the Church of Scientology footage. And, too, he’d veer onto a career path of mass spectacles — becoming the leading-man equivalent of the mature rocker, energetically playing his hits loud and long in stadium-size venues. It led, in part, to my Least Favorite Tom Cruise Interview Ever, conducted on September 9, 2013, by Elizabeth McNamara, attorney for the defendants in Tom Cruise v. Bauer Publishing. Excerpted pages from Cruise’s deposition that were published by RadarOnline reference the fencing between his and Holmes’s press squads; delve minutely into his schedule regarding time spent with Suri; and include testaments to the effort needed not merely to star in but to produce those large-scale entertainments, a litany of which has its own blockbuster-y rhythm, not a one of them sounding like a rom-com or for-your-consideration release: “I guess it was Mission: Impossible, Rock of Ages, Reacher, Oblivion, and then into All You Need Is Kill that eventually is to be called Edge of Tomorrow … ” For all the deposition’s grim accretion of daily detail, the lawsuit he’d filed was over a single word on a magazine cover, one with too much history to ignore. McNamara: Now as I understand it this action … part of what you’re complaining about is the use of the word “abandoned” on the covers, is that correct? Cruise: Saying I abandoned Suri. Cruise: I abandoned my daughter. McNamara: Okay. And you’re not complaining about anything else that’s contained in the articles, are you? Three decades earlier, in the fall of 1983, Tom Cruise shared with me the story of his life over a dinner in New York City’s theater district, a dinner he paid for with a credit card that read Thomas Cruise Mapother IV. He was 21, just a few years removed from the high-schooler who’d done a few plays and then been loaned $850 by his stepfather to give acting a shot, the guy who’d driven in a Pinto from Glen Ridge, New Jersey, into New York City, alongside his mother, who for some reason he wasn’t speaking to that day. During the meal, he’d talked of an itinerant childhood filled with new towns and new schools, conflicts and alienation and the need to reinvent in each new place — an ideal actor’s life, perhaps, but not the ideal child’s. He would also tell of a troubled relationship with his father, who had once put on amateur plays with Tom’s mother, and on whose shoulders his son would watch 2001: A Space Odyssey — but who Tom would characterize as emotionally unreliable and abusive. Their interactions had been fraught with Tom’s tears and desperation — one moment playing catch, the next a ball being angrily whipped at his head. It had led to divorce and hard times, for himself, his mother, and his three sisters — a profound estrangement. Three years later, Tom said he had made a kind of peace with both his father’s life and his passing. “I think he felt remorse,” Cruise said. Acting, he offered, had helped him deal with it all. He’d be nominated for his first Oscar in 1990, stepping out of the limo at the head of the red carpet with Nicole Kidman, with whom he’d fallen in love on the set of Days of Thunder. By 1993, they were several years into their marriage. After our interview that year for The Firm, I asked him if he had any memorabilia of his dad that he’d been able to share with her. He said he did not. I handed him a cassette tape of the conversation with his father. The new swerves that life had in store — and with them, the constant need to adapt and change that Cruise had learned about through his childhood — would present themselves soon enough. On that day in 2000 near Sydney Harbor, his mind was elsewhere. “Isn’t it beautiful? I’ll tell you, it’s a high-quality life. What’s that?” he asked, pointing into the bay. “I think they call that parasailing,” I said. Which reminded me: Had he ever listened to that tape of his father? And for the only time in our hours of interviews over the years, he asked me to turn off the recorder for a moment. Chris Connelly is the Editor-in-Chief of Grantland.